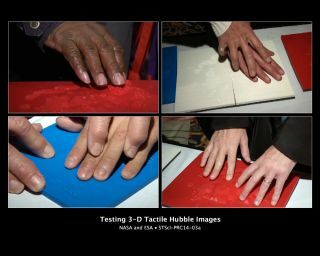 These images show people with visual impairments using their fingers to explore 3D tactile representations of images taken by NASA's Hubble Space Telescope. In these representations, stars, filaments, gas, and dust shown in Hubble images of the bright star cluster NGC 602 have been transformed through 3D printing into textures, appearing as raised open circles, lines, and dots. WASHINGTON — The Hubble Space Telescope's gorgeous photos of the universe have acquired another dimension to help the blind experience the cosmos. Astronomers with the Space Telescope Science Institute in Baltimore are using a 3D printer to turn Hubble images into textured pictures, opening up the wonders of the universe to people who are visually impaired. Hubble scientists released a video detailing the 3D-printed universe project after unveiling effort at the annual American Astronomical Society meeting here on Tuesday (Jan. 7). "Sure, we cannot see the image, so we don't know exactly what it looks like," added Worley, who is one of about 100 visually impaired people who have helped test the prototype images thus far. "It can never replace pictures, but with this 3D image you can get an idea of what it's supposed to look like and then use your imagination for the rest." The first image the researchers printed was the star cluster NGC 602 in the Small Magellanic Cloud, a neighboring galaxy to the Milky Way. "It's very easy to take any tool or object that you can actually measure and produce a 3D printout," Antonella Nota, one of the astronomers working on the project, said in a statement. "But it's very hard to think of an astronomical object about which you know very little." "You can measure the sizes and brightnesses of space objects from the images, as well as some of the distances. But it's really hard to understand their 3D structure," Nota added. "The work is scientific, but it's also guesswork and artistry to try to produce an object, which printed, will look like the image that Hubble has taken. So, we are basically designing the process from scratch." The scientists model stars, dust and gas in plastic using different textures with raised lines and bumps all printed out by a 3D printer. Taller features signify the brightest parts of the image. For example, a group of stars in the core of a cluster is represented by a group of circles, Hubble Space Telescope officials said. "Imagine making a visualization that you visually fly through, and as you fly through, first you encounter filaments, and then you see some dust and also some stars," Carol Christian, another astronomer associated with the project, said in a statement. "As you fly to the back side of the cavity, you see other features. I want to represent that in 3D and have people feel it with their fingers because they can’t see it." "They would be able to spatially understand where important features are relative to everything else and what the structure is," added Christian, who discussed the Hubble 3D printing project here Tuesday (Jan. 7) at the 223rd meeting of the American Astronomical Society. "We may have to do it in layers, or we may have to do it in some other way. At this point, we’re jumping off the platform and seeing what happens." Ultimately, Christian and Nota hope to create 3D files of every Hubble image, making all of them available to schools, libraries and members of the general public who have 3D printers. "Our ultimate goal of having the 3D image files available to everybody is for the long-term future," Nota said. "But you have to think big when you're doing something like this. Maybe sometime in the future you will be able to press a button and out comes the object Hubble has imaged, and you will be able to hold it in your hands."